Growing up we had lots of traditions, most ridiculous. My family is famous for saying to each other, “come on! It’s tradition!” Any outsider who hears it usually thinks we are crazy people because we are talking about things like Tootsie Pops at the cottage or decorating Christmas cookies as full-grown adults. I don’t remember my parents ever saying, “Ok, so we are going to start a tradition where we play Uno at the cottage and in accordance with this tradition, we are going to gang up on each other mercilessly.” Nope. It just happened. And if you tried to pass on playing with us? We all started to whine at you, “BUT IT’S TRADITION,” until you cave. Happily, it seems that the traditions that are being carved out in the Sluiter family are happening the same way: accidentally. It just happened. Charlie’s middle name is Thomas, my dad’s name. Alice’s middle name is Katherine, my name. We were also fortunate enough to be able to have Eddie baptized on Cortney’s dad’s birthday (also, his great grandfather Edward’s birthday coincidentally). From that another tradition started. 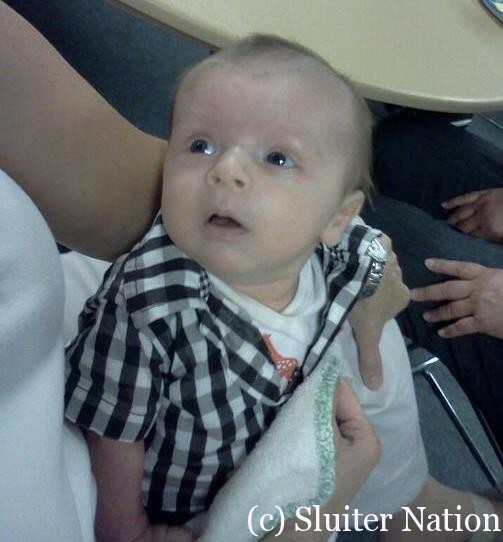 Charlie was baptized on April 29, the day before my dad’s birthday (whom he is named after). And so, because Alice’s middle name is also my name, we wanted her to be baptized near my birthday to make the tradition complete. 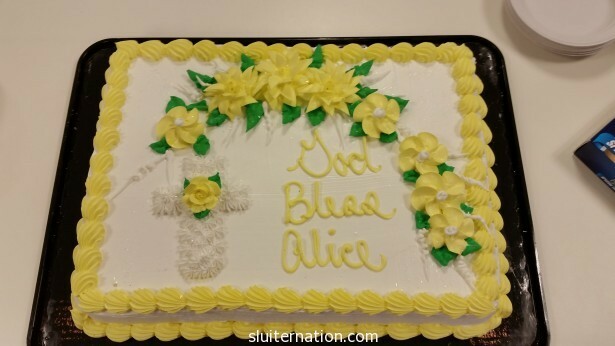 My birthday was Friday, March 27, so Alice’s baptism was Sunday, March 29. It was also Palm Sunday, the start of Holy Week, so the service was going to be special anyway. The little kids sang (that includes Eddie) and marched around waving palm branches. Cortney missed this part of the service because the cake we ordered for pick up before church, went missing and they had to quick get us a stand-in. I thought I was going to puke with nerves. 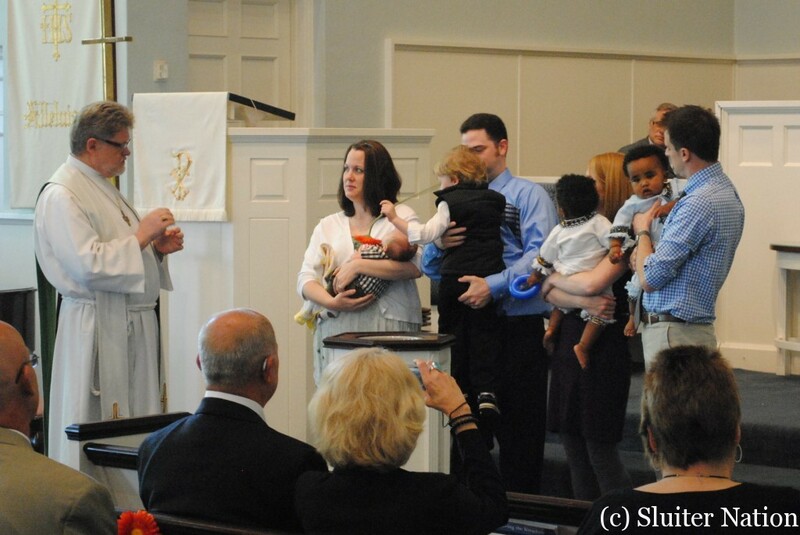 I kept imagining the baptism being only me and Eddie standing up there. Cortney and Charlie made it just as the little kids were getting ready at the front of church to listen to the children’s message about baptism. 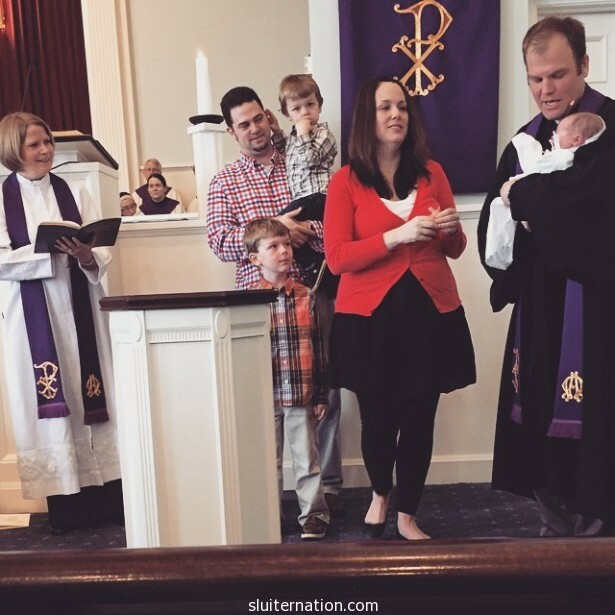 Eddie and Charlie’s baptisms were special, of course, but Alice’s was extra special…at least to me, and I think to Cortney for the same reason. With Eddie we weren’t going to church really at all, and with Charlie we were going only very sporadically. Now, however, we are very much a part of our church family. In fact, our pastor and his wife are close friends of ours. I thought that this baptism would have a little smudge of sadness on it for me since it’s one of the first “lasts” of this being our last baby. The Last Baptism. I didn’t feel that sadness though. I felt joy and blessings as a woman who is quickly becoming my friend, asked us if we will bring our baby girl up in the church. I felt peace and love as a man who we love took our daughter in his arms and lovingly baptized her in the name of the Father, Son, and Spirit. I felt a sense of completeness as my family is now all here. My people are all with me. We are all baptized and part of our church family and the Body of Christ. My mom pointed out after the service that our pastor does not skimp on the water. He just chuckled because he says he loves to “pile on the grace”. 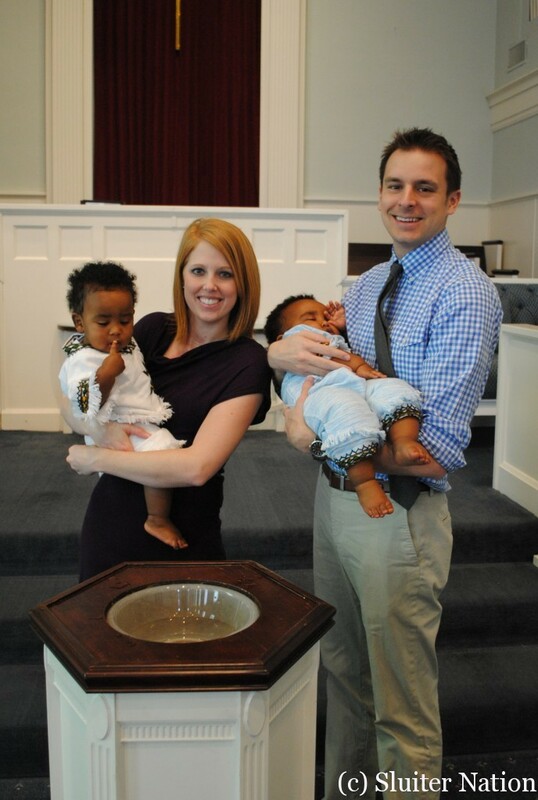 It struck me as he washed the baptismal water over Alice’s head that she has no idea how loved she is. I looked out into the congregation and saw not just our family smiling, but the entire church family. When asked if they will help us teach her the love of Jesus, the “we do” was booming. Alice let out only the tiniest of peeps when the water trickled down her forehead. For the most part, she slept comfortably in her gown in the arms of those who love her. After the service, she was surrounded by her church “grannies” as well as her actual grandparents and aunts and uncles and cousins. And then I thought of this space. All you readers. How much you have loved on Alice since I announced her tiny fetus self was living in my womb. All the prayers and positive thoughts you’ve all sent her…all of my family, actually. Thank you to all who participated in Alice’s special day by either being present in body or spirit. Thank you to all who took pictures and shared them with us (Liz, Nancy, Gretchen). Thank you also to Gretchen for the beautiful gown and to Mary R and Gretchen for the hankie/bonnet that will get saved for Alice’s wedding day. We love you so much. Sunday was a special day for our family. Our whole family gathered in our little church to witness our promise that we would teach Charlie about the love of Jesus. Picking a date was important. I know some churches just tell you when “Baptism Sunday” is because they do a bunch at once, but our church is small. 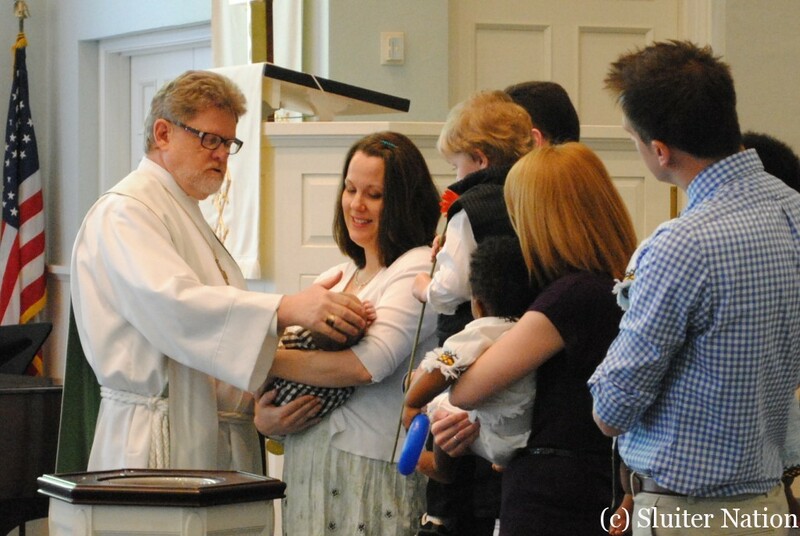 Baptisms get scheduled as babies are born, so it was pretty much up to us when we wanted it to be. Eddie’s baptism date is super meaningful, so I didn’t want Charlie’s to just be random. 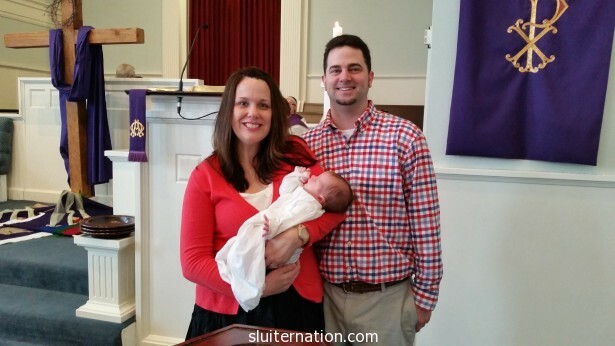 Since Eddie was baptized on his namesakes’ birthday, we wanted to do the same for Charlie. However “Charles” is not anyone’s name but his. However “Thomas”, his middle name, is after my dad. And my dad’s birthday was yesterday. 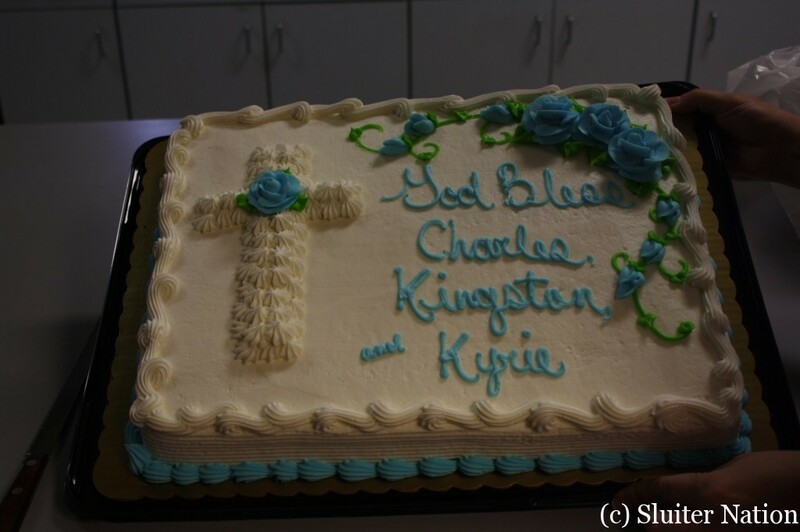 We settled for April 29 as the Baptism date because it was the day before Charlie’s namesake’s birthday. 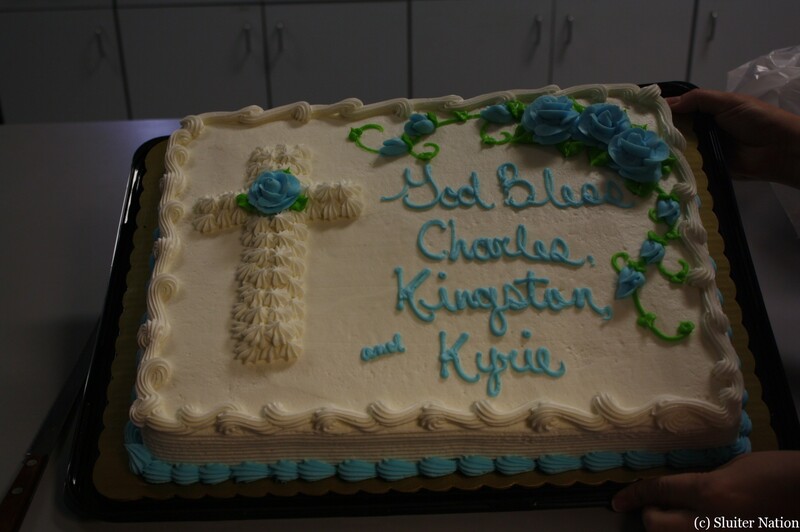 To make it even more special, Charlie’s cousins, Kingston and Kyrie, were baptized alongside him. i chose a safari shirt since he was getting baptized with his ethiopian cousins...can you see it? Charlie never woke up. 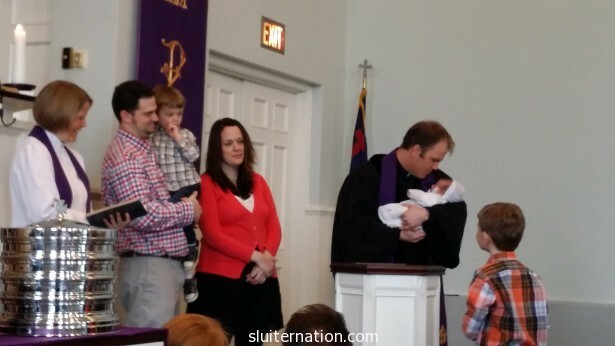 First baby in Pastor John's history to not at least squeek. Eddie was very good, but so very done by the time pictures were taken. And Kyrie was just plain tired. The day was sunny and breezy. Almost every member of our extended family could be there…including Charlie’s great grands. I know it’s just a five minute part of a church service that otherwise is not about the baptism. I know for some people the Baptism is just a formality and not something to throw a huge celebration about. But it’s special to me…to us. 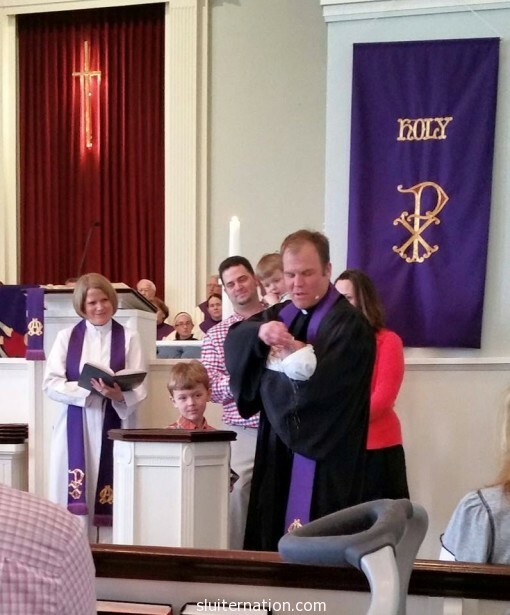 I guess I can’t speak for Cort, but for me, the ritual of standing before the congregation and our closest friends and family and promising to teach our son about God’s Son is important. It’s a big deal. Not so that those people can constantly point out our shortcomings in our teachings; we don’t need help knowing we fall short and are frequently hypocrites. I know we don’t have the best attendance at church, but that doesn’t mean we aren’t teaching our boys about the love of Christ. 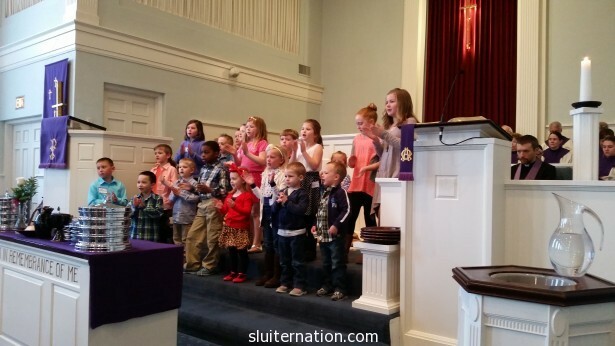 It doesn’t mean we aren’t teaching them to pray and sing to God. It doesn’t mean it’s not talked about in our house. It doesn’t mean that Cort and I don’t try our hardest to show, not just our boys, but the world, the face of Jesus in everything we do. We invite those we love to hear our promise so they too can be part of that promise. So they can fill in where we fail. So they can talk and sing and model for our boys the love and compassion of Christ. And we are trying so hard to be in church more as a part of that modeling. Because we promised we would bring the boys up in The Church. Incidentally, the sermon this day was about healing through Christ’s salvation. The Pastor talked about Christ being all around us in the faces of each person we encounter each day. 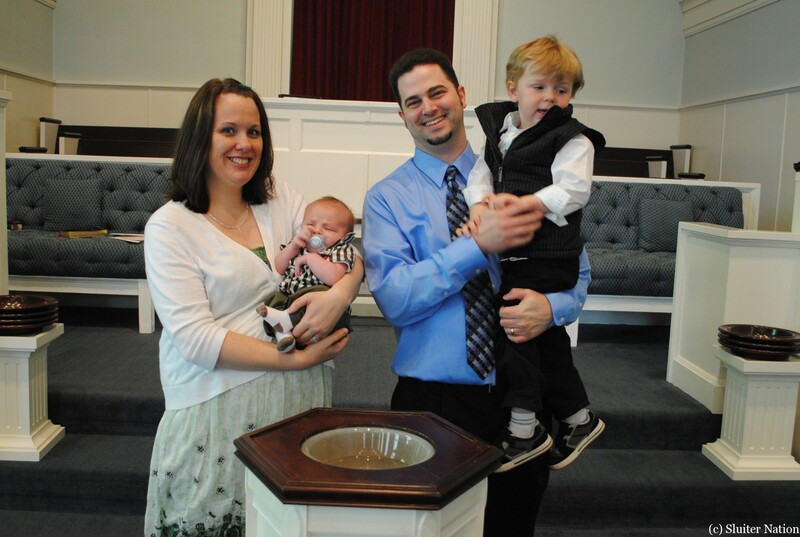 Throughout the service, two tiny babies were on my mind, needing the healing hand of the Lord. And their mother needing strength. If you are the praying sort, meet Diana and her boys…whom she almost lost…and is now fighting to save.